Dr. Jamin Brahmbhatt is a qualified doctor specialising in the field of urology and robotic microsurgery. He completed his urology residency at the University of Tennessee Health Science Center followed by a clinical fellowship in robotic microsurgery and male infertility at the University of Florida. He is the co-director of The PUR Clinic (Personalised Urology and Robotics Clinic) at the South Lake Hospital and Orlando Health. Dr. Brahmbhatt has a special interest in men’s health and has published articles on testicular pain and infertility as well as being an active member of local and national healthcare organisations. He is passionate about using science and technology to inspire our future leaders and has organised several robotics-based internships for high school students in the USA. 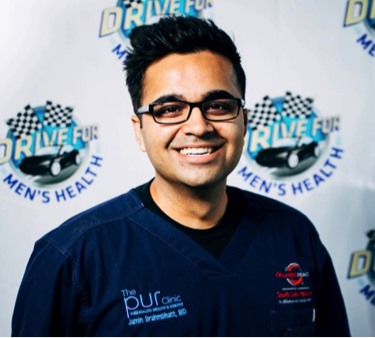 Dr. Brahmbhatt is one of the co-founders of the national campaign, Drive 4 Men’s Health which has reached 400 million men and encouraged them to improve their overall health. He uses social media to reconnect health care professionals to what they love most – helping others. Dr. Brahmbhatt continues to discuss a wide variety of health topics in the media and has been featured on Fox News, CNN, CBS Radio, Everyday Health, Yahoo Health, and Men’s Fitness among others.